In 1933, the Boy Scouts of America published The 1933 Scout Jamboree Book. 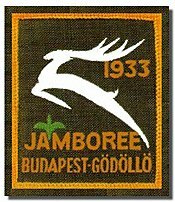 This report tells the story of American participation in the 4th World Jamboree was written by James E. West, Chief Scout Executive and William Hillcourt and published by G. P. Putnam’s Sons, New York and London. 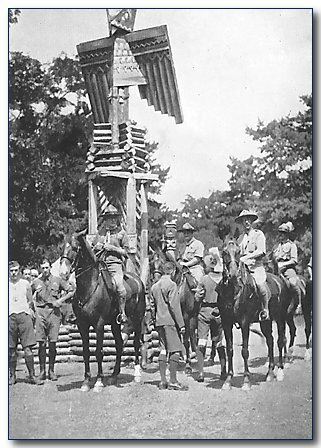 It continued a series begun with the publication of The Scout Jamboree Book after the 3rd World Jamboree in 1929. FOUR hundred and six lucky American Scouts and Scouters have returned from one of the most outstanding events of their Scouting lives—the Fourth World jamboree. For two full weeks, they mingled with Brother Scouts, from all parts of the world, gathered in the Royal Castle Park of Gödöllõ, seventeen miles east of Budapest, Hungary. And as they came back to their homes, they brought with them the friendships of boys from countries far away, the memories of a glorious adventure and a realization of the world-wide reach of our Movement. This book, a straightforward narrative of that amazing event, tells the story of the Jamboree to the many thousands of American Scouts and Scouters who were not able to attend. It will unroll for them the thrills experienced by every boy who was there and will give them a glimpse of the soul of the Jamboree, the spirit of friendliness among the boys of the world, gathered together, proving that the Scout Ideals are live ideals, that the Scout Oath and Law stand for the best qualities within any boy’s heart—regardless of race, nationality or creed. In the preparation of this material I have had the editorial assistance of Mr. William Hillcourt, a member of the Editorial Staff of "Boys’ Life." We gratefully acknowledge our thanks, for the cooperation in preparing this book, to all the Scouts and Scouters of the American Jamboree Contingent, but particularly to Irving Axelrad, Clarence R. Pierce, Fred Bliss, Raymond Royal, Lynn Brua III, H. T. Sawyer, Charles Cherris, Joe Summers, Stan Goulter, Stuart P. Walsh, Mervin Rea Helmreich and Jack Williams. As Honorary President of the Boy Scouts of America, I take great pleasure in extending greetings on behalf of this Association to the Scouts and Scouters assembled at the Fourth World Jamboree and Seventh International Conference of Scouting, representing practically the whole civilized world. Since the beginning of our Scout Movement in America twenty-three years ago, more than five million men and boys have been enrolled as members, and on their behalf I send this message to Lord Baden Powell, Chief Scout of the World and to brother Scouts abroad. It stirs our imagination and kindles our emotions to contemplate the possible implications growing out of this pilgrimage of these young men and boys representing more than seventy different nationalities camping and living together for two weeks in good fellowship and harmony. The future basis of international good will must rest on mutual understanding and loyalty to high ideals. Such gatherings as this are among the most important contributions to world peace that have ever been developed. I wish the Boy Scout Movement every success in this splendid undertaking and earnestly hope that the magnificent possibilities of this occasion will be realized to the Greatest extent. Chapter III. In which we Use the opportunity to "See America First" . Chapter VIII. In which we Go Shopping, Visit the Air Scouts and say Good-by to B. P.